The idea of bringing together four sort of dissimilar yet still big-name directors to tell stories about the power of cinema in honor of Hindi cinema's centennial is such a good one. The component films by Karan Johar, Dibakar Banerjee, Zoya Akhtar, and Anurag Kashyap (which play in that order) are strongest when they stick to that mission of celebrating the magic, both light and dark, of movies. Imagination, passion, talent, family, promises, dreams—and, I think very significantly, the decision to act on those things—are all depicted thoughtfully and compassionately. There is support and empathy for small-scale individuals, which is an unusual offering from an industry known for bombast and family or community values. People make difficult decisions that we suspect will have un-filmi outcomes, some of which are even depicted bluntly. A streak of resignation runs throughout the four stories, with characters realizing and largely accepting that life is not always like the movies. There is wonderful variety within the telling of the four stories: humor and fluff are used in various purposeful ways, the details in sets and locations create instant richness in the lives of people with whom we will spend no more than forty-five minute, and there are significant characters of different ages, backgrounds, and identities. For a project that might be assumed to have such a glamorous purpose, Bombay Talkies' stories feel contextualized in a remarkably normal world (or at least are meant to evoke it), with no infusion of glamour or escapism that the audience is supposed to accept as real in the context of the film. Maybe this ordinary setting is an affectionate tribute to the billions of everyday people who have filled cinema halls over the century? Karan Johar's piece ("Ajeeb Dastaan Hai Yeh") is cruel and bleak in its own sort of soapy and probably oversimplified way, and I certainly never expected that from a KJo film. I'm so impressed with what he tries to do, creating a moving story out of three characters who according to mainstream Bollywood traditions (of which he is the standard bearer among this collection of filmmakers) should be unappealing and unsympathetic or even outright demonized: a gay man (Saqeeb Salim) who disobeys his father, a woman (Rani Mukherjee) who acknowledges marriage cannot solve or subsume everything and refuses to stand by a husband who cannot make her happy and whom she can never please, and a head of household who finally braves a moment of letting the facade crack and the pieces of it fall. "Ajeeb Dastaan Hai Yeh" uses film songs to inspire but also to create a world of retreat and protection. It's so easy to imagine Dev (Randeep Hooda) in the chair in his record room with earphones tightly on, losing himself in old film albums instead of facing his problems. And what a lovely contrast with the little girl at the train platform who has an equal love of songs but none of the comforts of a physical collection or special place to hear them and for whom songs are her way of engaging with the world and making it notice her. Dibakar Banerjee's "Star," based on two Satyajit Ray stories,* is the favorite segment of most people I talked to when Bombay Talkies came out last year. For me, it will have to share that spot with KJo's because what he offered was so unexpected and moving to me, whereas I have more exacting standards for Banerjee, who over his career has created four very different but consistently impressive, engaging, and interesting feature films. 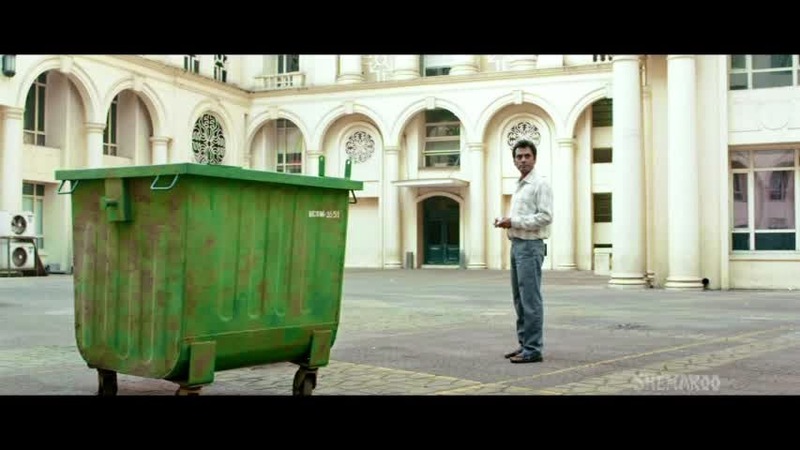 This is the only of the four shorts that I wish could be a feature film on its own, and that is due not only to Nawazuddin Siddiqui's performance—THAT FACE!—but also to the story and its almost otherworldly treatment, with the taken-as-normal emu and imaginary Obi-Wan type figure (the protagonist's teacher) who dispenses important life lessons from a dumpster on a gaping, eerily quiet film set for the movie within the movie. The irony of "Star" is that the brightest glow, the most shiny shining, happens at the central family's home, well out of the range of cameras and crew of its fictional Ranbir Kapoor film, and is utterly unscripted. The power of cinema and, more importantly, the pull of telling and hearing stories stay with us long after we leave the theater or the set. It's lovely. the expert who comments on dreams and dedication and work ("Star"), and the absolute faith we place in celebrities and the strange ways we respond to their presence ("Murabba"). She's also the only filmmaker who lets her characters actually go to the cinema, reminding us of the locus of all this power. I cannot tell if "Murabba," Anurag Kashyap's funny tale of duty and faith, is tongue in cheek or not. Maybe it's both staggering toadyism and a self-aware critique of the same? Those of you who understand the nuances of Hindi will have the best shot at figuring this out; to me the visuals, body language, facial expressions, and even the story can support both readings. And either way, this piece recognizes the absurd: the longer it takes Vijay-from-Allahabad (Vineet Kumar Singh) to achieve the mission he thought he could do in a day, the more frantic and invested in it he becomes. The person who started as a phlegmatic young man turns into as much of a loon as the look-alikes and prophets he meets outside Prateeksha. "Murabba" follows this fevered pitch with a funny and (to me) unexpected de-escalation of the drama, and in an appropriately filmi way it re-establishes the balance of fan and celebrity, of telling stories with being in them. I really have only one problem with Bombay Talkies, but it's a biggie. In some significant ways, this film is ragingly sexist. Just like the utter fail of a Filmfare cover in honor of the Hindi cinema centennial the featured only Dilip Kumar, Amitabh Bachchan, and Shahrukh Khan in an ignoring, maybe even a negation, of female contributions or even presence, taken as a whole Bombay Talkies consistently assumes that the male experience and point(s) of view are the universal and the default. There are some significant females in the stories here, but if you measure the importance given to each character's thread, the overwhelming majority of emphasis is on males. Mothers are less prominent and effectual than fathers, and sons are more important than daughters. Each of the four fails the Bechdel Test quite spectacularly, even when women of different ages or states of being imaginary are included. Let's look at each individually and see how little regard they have for female voices. • "Ajeeb Dastaan Hai Yeh" is, in my opinion and much to my surprise, the best on this front. While I do not find all of KJo's films troubling regarding women, we must never forget that this is the man who has presented probably the most egregious destruction of a non-standard-femininity heroine in Bollywood history (perhaps tied by the fall-in-line makeover of Konkona Sen Sharma's character in Aaja Nachle) and a heterosexual (ahem) love triangle in which the center woman was the least relevant character in the film (Student of the Year). Rani Mukherjee's character feels whole to me; while her marriage is certainly a central focus of the film, we also see her making decisions voicing her own thoughts about her own desires and needs. She makes a close new friend on her own and she clearly cares about her career. The little girl at the train station, who should by demographics be utterly powerless, is an important figure, though mostly for what she tells us about or sparks in the male leads. • "Star" also has a little girl with more influence than we might expect, even though I don't think she wields it deliberately. There's also a female crew member in the film within this film who has quite a few lines, but she is mostly talking either to the hero of the film we're watching or about the hero of the film he's in. Women are a large part of the texture of the central character Purandar's life: his wife, his daughter, all the neighbors in the apartment building with whom he cheerfully shares washing-up duties. • "Murabba," in which no women speak at all, leaving me likewise speechless. • The title song at the end, full of archival clips and current stars singing about the film industry as musical cues relate to their famous songs, is probably the most odious to me because the only "real person" in it is a (young) man. A whole theater full of seats, all empty except for one reserved for the chosen male child. Why not a theater full of people with the camera spending a little bit of time with several different people, both individuals and groups? And what about the power of cinema to bring us together, to create to and reinforce shared culture? Transporting and amazing one individual with cinema is a grand idea; eliminating all but one civilian face and implying that the 25-year-old man is a surrogate for us all is lazy bullsh*t.
As with the Filmfare cover, maybe attending to the hero above everything else is indeed the ultimate way to honor Hindi cinema. How sad. * Infusing a celebration of Hindi film with India's most famous film figure but who rarely worked in Hindi, perhaps as a nod to both the filmi nature of some of Ray's work and to all the Bengali stories that have become Hindi films? Sneaky. Point: Bengal. Managed to watch this film over the weekend, again. Somehow the first time I watched it, I was disappointed with how it was so 'plain'. But over repeated viewing, I have come to like this collection of stories. I expected to love 'Star' as it's based on one of my most favourite stories by Ray, but somehow the one that manages to impress me every time is the one by KJo. Unexpected, from him. Purandar's physical presence on the screen is grand enough to wish for a full film, and 'Murabba' to me is just an ode to the madness of films. Something that only survives today in smaller cities of India. p.s. U mentioned 'Star' based on 2 stories. Do you know which ones? I only knew one, 'Potolbabu, filmstar'. I started watching Bombay Talkies, on a flight to India. At the time, I wasn't aware that it is a set of four short features from four different directors. After about ten minutes of Ajeeb Dasta ..., I was so disgusted I moved on to another movie - The Butler, and then on to another. Coming back to US, I see that there is a copy of the DVD in my local library, but I am not interested in getting it and giving a shot for the other three on the disk. I enjoyed all four segments, but I'm not sure if any of them could have supported a full-length feature without cracking under the weight, or without removing the focus from the story by adding subplots and the like, in just the same way few short stories in anthologies could be expanded into full novels (although I'm aware plenty of novels started life as short stories). The best thing that shorts such as these can hope for is to offer a glimpse at a bigger story, and I think all four chapters of Bombay Talkies manage that, although the Kashyap section, in all its Haruki Murakami off-kilter glory, an air each of the other three parts share to lesser extents, is the most self-contained of them. When I started watching it, I was expecting some sort of back-slapping rollercoaster celebration along the lines of Om Shanti Om, so the fact that it's all quite low-key, reflective and progressive (relatively) took me pleasantly by surprise. What didn't take me by surprise was finding that Nawazuddin Siddiqui was the best bit in the whole thing. Despite the sexist worries, you make me want to seek it out. I was surprised that it didn't seem to have come to my local Indian cinema, and if it did, it was only there one week. I had read the synopsis, and thought it was an interesting idea, but the clips I watched, had me less than excited. The big title number was interesting, somewhat, but the music itself was so bland. Then the plot of Zoya's film made me think of a film that I'd seen at a filmfest in NYC, Pankh (2010)that left me with a decidedly bad taste in my mouth...creepy. Non-sequitur: Will they ever give Ronit Roy a non-abusive role in a film? Pankh, Udaan, 2 States... he's so good at those kind of roles, but really, I'm sure he can do others too. Korak - I was told that just a portion of it comes form "Pterodactyl-er Dim" but I haven't read the story myself, so I am not to be fully trusted. :) I'm glad you gave the film another try and I hope more people will! I think you're write about "Murabba" being mostly about the madness of movie-derived celebrity, no matter the tone towards it, and you make a good point about smaller cities. It was the only of the four that had any setting outside Mumbai at all, isn't it? pKrishna - Watching things on a plane is never the best setting, unfortunately. What disgusted you about "Ajeeb"? Nikina - Good point about the focus that is enabled by the short format. Zoya's in particular, I think. I too had expected back-slapping - that's the perfect word for it - and was so happy to find nothing self-congratulatory and nothing in-joke-y about this movie. I really liked Zoya Akhtar's story. What I felt was that Vicky's father had a similar past. In the first scene, when Vicky is not able to play football, his father is deeply disappointed but he does not scold him (unlike Dev in Kabhi Alvidaa Na Kehna who scolded his son when he wanted to play the violin). He just enrolls him in the coaching class and says, 'kya acha nahi lagta that is not important, kya acha hai that is important". At another point, when Vicky dressed up as a girl and starts dancing to the song Aaj Ki Raat, Vicky's father comes home. Vicky's sister and mother laugh it off but his father, he smiles for two three seconds and then suddenly becomes angry. Some of the biggest homophobes are themselves homosexuals as portrayed in the terrific film American Beauty. Was this the reason of his anger at his own son that he does not turn out this way? This was when I felt that perhaps he had confrontations in his own childhood. In the middle of the night, Vicky wakes up and goes and eats 'kaju ki barfi' as if trying to find that sweetness that will comfort him. It is in that moment when he is eating the 'barfi', he watches a show where Katrina Kaif is talking about her dreams, giving Vicky his 'sweet dreams'. As each and every scene in Luck By Chance had a flower as a leitmotif, in this film as well she uses flowers in almost every scene. Whether be it the background paintings, clothes, jewelry or for that matter the sketched flowers in the ticket. It was a decent watch. By the Way good Review.